Argentina is the second largest country of South America, it borders in the North on Bolivia and Paraguay, in the East on Brazil, Uruguay and the Atlantic Ocean, in the West on Chile and in the South on the Atlantic South Ocean. The country has 40 million inhabitants, many Spanish, Italians, Germans and French immigrated to Argentina, being the most European influenced country of the subcontinent. 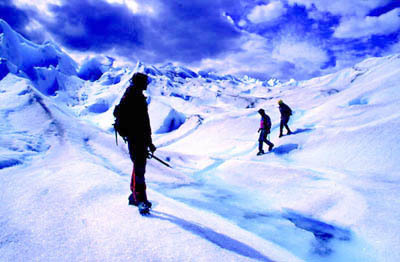 Argentina is a fascinating land of contrasts along its 3.694km (2.295mi.) from north to south and 1.423km (885mi.) from east to west. You can find impressive waterfalls at Iguazu (one of the new 7 wonders of nature), rich cultural ancestors in the Northwest, delicious wines Malbec (red wine) and Torrontes (white wine) near the imposing Andes Mountains (highest peak in South America), you can feel nature at the lakes area close to Bariloche, see breath-taking glaciers around El Calafate, you can see abundant wildlife at Puerto Madryn, you can visit the city of the end of the world in Ushuaia, taste delicious local cuisine all over the country and of course, you can feel Buenos Aires, the capital city and one of the most cosmopolitan and exiting places of the world. All this in just one country! The official language is Spanish, but in bigger towns English is also quite common.